The designers Chengyuan Wei, Guanyun Wang, Ye Tao, Jianxing Cai, Chao Chen, and Xuanxing Yang came up with the upcycled lamp. Each paper cup was first cut in half length-wise, and then arranged in a scalloped roof-tile pattern held together with hot glue. 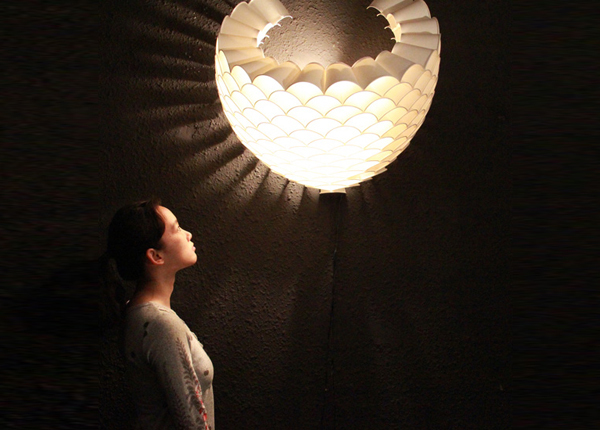 Resembling a fish-scale pattern, the lamp shape slopes into an organic half-egg shape. The lighting elements are fitted at the bottom, creating a gradated warm glow. The cup bottoms cast columns of light that fan out around the bottom of the lamp. Since it casts such a warming, luminous glow, a lamp like this could be a great weekend craft project to fend off the winter blues! Might this work with plastic cups and a lower power or LED bulb so that the heat wouldnt' melt it do you think? after you put the cups together what do you do? This luminous lamp is created from old upcycled paper cups. The lamp is stunning it is simplicity. 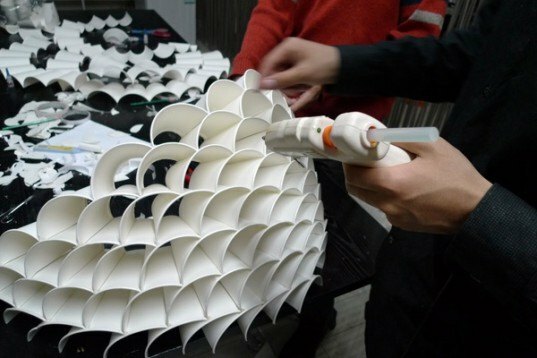 The used paper cups were cut in half and glued together with a simple hot glue gun.